Director – Adam Massey, Screenplay – Court Crandall, Producers – Adam Massey & Lincoln Stalmaster, Photography – Patrick McGowan, Music – Eric Cadensky & Nick Dyer, Digital Visual Effects – Invisible Pictures (Supervisor – Noel Hooper), Special Effects – Performance Solutions (Supervisor – Mark Ahee), Production Design – Oleg Savytski. Production Company – Rebelhouse Productions/The Stalmaster Company/Darius Films. Cody Brewer is a lobster fisherman struggling to make a living in the tiny New England town of Prospect. 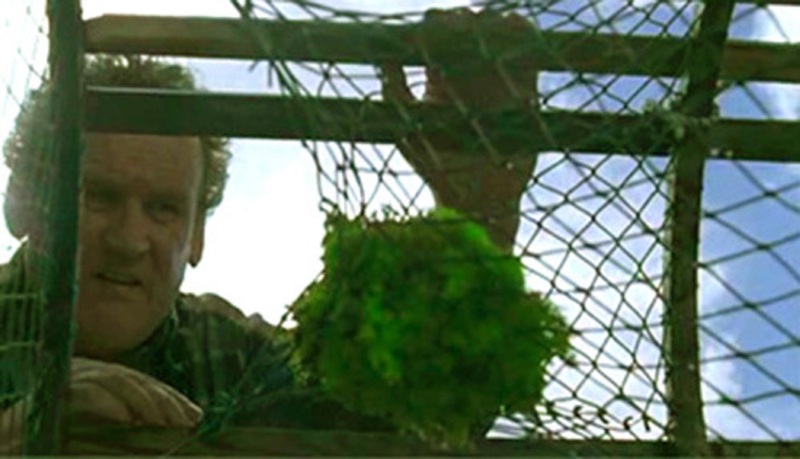 One day Cody finds a strange bright green moss in one of lobster pots he hauls up. He places the moss in a tin and thinks nothing more of it. The next day Cody accidentally cuts his finger off on the boat’s propeller. After he places his bleeding stump in the moss, he is startled to find that the finger has regenerated. He returns to shore just as local bait salesman Rusty Kendrick is badly burned in a fire. Cody places the moss on Rusty’s arm and it regenerates the burned skin. The story spreads around the town and soon all the locals are approaching Cody asking to use the moss to heal everything from bunions and halitosis to impotence. Cody figures that he only has enough moss left for two or three miracles. He places the moss in a jar and leaves it on top of his tv set until the right occasion to use it comes along. A bully at school tries to force Cody’s son Jake obtain the moss for him. The pressure on Cody from the locals grows with a homeopathy company even offering him $250,000 to take the moss off the market in order to protect their product. As Cody debates about what to do, he finds that someone has stolen the moss. This US/Canadian indie production is a film that has been made with good intentions, a reasonable degree of craftsmanship and a fine cast line-up. It however appears to have attracted almost no attention in release, outside of appearing at a handful of film festivals. Behind the quirky title, A Lobster Tale is a work of Magical Realism. Indeed, all you have to do is think of a version of The Shipping News (2001) – though set in New England, the film is actually shot in Nova Scotia, the same locale as The Shipping News – but with Magical Realist overtones. Director Adam Massey takes the same humorous view of the smalltown locals that Lasse Hallström does in The Shipping News, finding the comic quaintness beneath the outward dullness of life in such a quiet place. The pace of the film is extremely laidback. Usually this is the sort of film that is sold to the over fifties crowd. The Magical Realist elements regarding the miracle moss are played in a series of eminently predictable story arcs. You can see all the big plot revelations coming up – that the son was the one who stole the moss, that the bully was wanting the moss for himself all along. In fact, A Lobster Tale could almost be a light fantasy miracle comedy of the 1940s – albeit translated to the surrounds of a dreary New England fishing town. All of that said, beneath its quaint view of its locals and comedic happenings, A Lobster Tale does not have a particularly nice view of human nature. Indeed, its end message seems to be that most people are self-absorbed and the majority of their ailments and medical complaints are in their heads, if only they would get said heads out of their respective asses. Like the resolutions of a good many of these type of fantasies, the end assumption is that the best things in life are those under our noses, that we are wrong to want for more and that because it is not naturally earned the miraculous should be treated with suspicion. Unfortunately, when you apply this thinking to medical ailments – that people should be deprived of life-changing treatments and have to suffer with debilitating conditions because the treatments are not ‘natural’ or ‘earned’ – this message cannot help but seem unfair if not cruel. The film has some well written patches – especially the speeches given to Alberta Watson in one sequence where she likens her marriage to swimming close to the shore and looking to the light of the lighthouse, or where she explains to Colm Meaney how she doesn’t need money to feel happy and loved. All of the cast give fine performances with Colm Meaney being solid and reliable as always and getting fine support from the underrated Alberta Watson. Graham Greene steals much of the film as an impassive comic sheriff. Adam Massey took nearly a decade to make another film. He subsequently made the ghost story The Intruders (2015) and the Found Footage horror Man Vs. (2015).